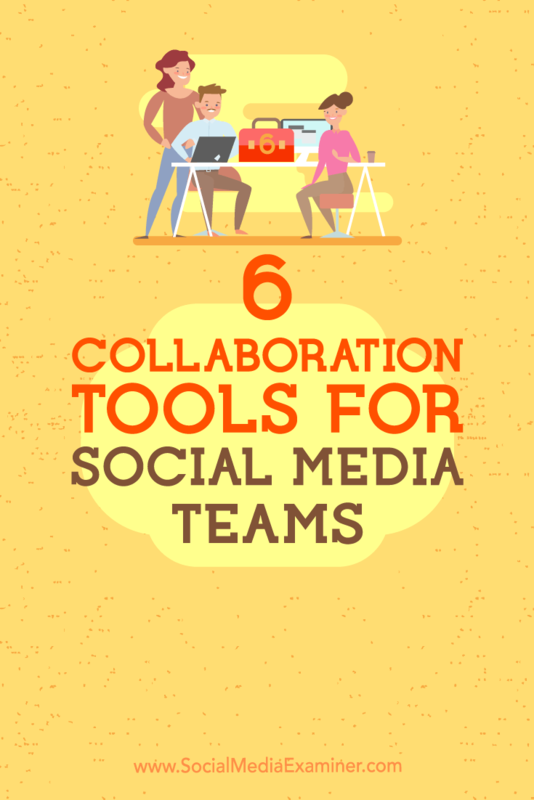 In this article, you’ll discover how to use six collaboration tools to keep social media teams and stakeholders on the same page. 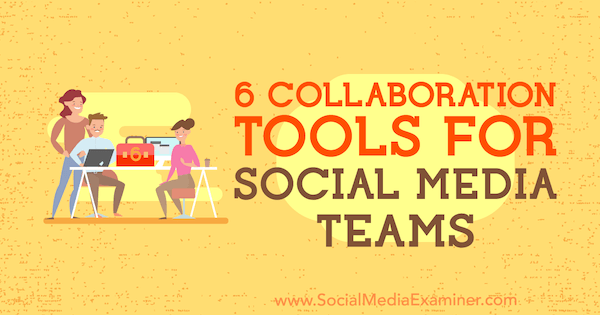 6 Collaboration Tools for Social Media Teams by Adina Jipa on Social Media Examiner. 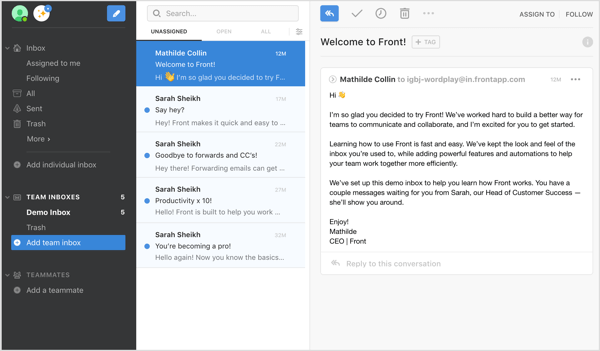 Front is a tool designed to help teams collaborate efficiently and manage customer demands from a single location. Front offers a 14-day free trial, and after the trial period ends, you’ll need to upgrade to one of the paid plans, which start at $19/month. You can set it up to receive messages from multiple communication channels so your team can comment, assign, and reply to those messages. 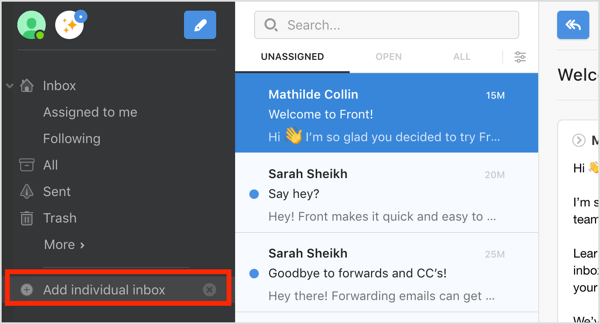 After you sign up and log into your Front account, you’ll notice the interface is similar to a classic email application. Connecting Front to your company’s Facebook or Twitter account will allow you to receive messages from customers directly to your inbox. To connect your Facebook page, click Add an Individual Inbox in the top-left corner of the dashboard. On the right side of the screen that appears, click Facebook. Note that on this same screen, you can set up access for your Twitter messages, SMS, and more. Next, click the Connect to Facebook button. Now select the Facebook page(s) you want to manage in Front. When you’re finished, click Create Inbox. When you go back to the main workspace, you’ll see the Facebook page you connected in the left navigation. 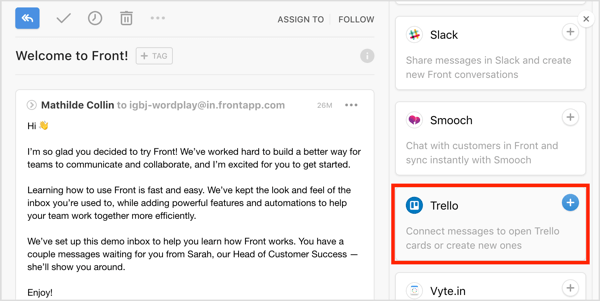 Now that you’ve set up Front to receive customer messages from your Facebook page, install Front’s free Trello integration so you can reply, assign, and work on those emails via a Trello board. To do this, go back to your main Front dashboard and look for the integrations list on the right side of the screen. Select Trello, which will allow you to create Trello cards from your Facebook messages. On the next page, select the slider to enable the Trello integration and then click Save. To test the setup, ask someone to send a message to your Facebook page. You should notice that the message appears in the inbox you just created in Front. Open the message and click Tag next to the customer’s name. Then click the Add to Trello option in the drop-down list. 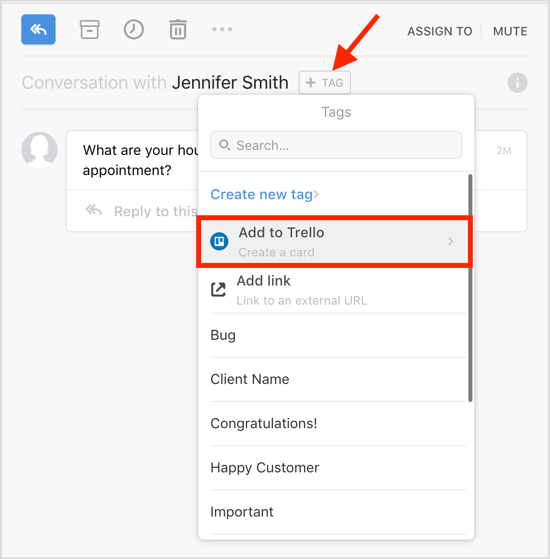 Fill in the Trello card to assign the message to your team for follow-up. 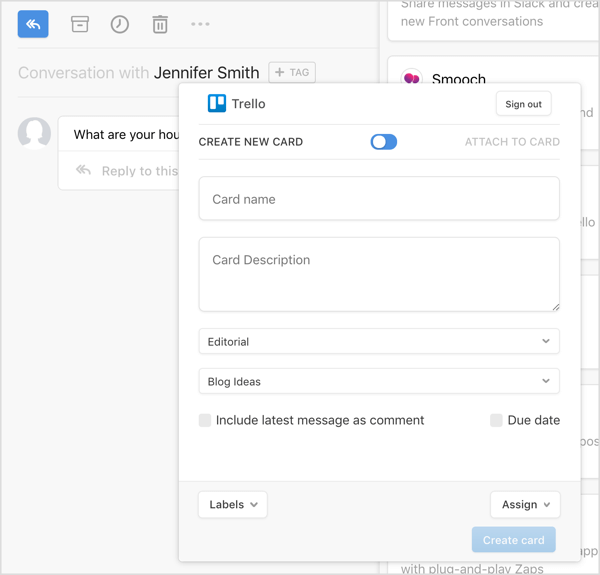 Now, go to your Trello account and you should see the message there as a card that you can manage as you like. Planable is a tool that will let your team create, plan, approve, and schedule Instagram stories using one app. To get started, go to the Planable website to sign up for a 14-day free trial. After the trial period ends, you’ll need to upgrade to one of the paid plans, which start at $24/month. Next, install Planable on your mobile device from the App Store or Google Play. You’ll need to give Planable permission to send notifications to your phone and access the photos on your device. When you’re finished, go back to the account you created on the Planable website and click Create a Workspace. The workspace is where you create, manage, and publish posts while keeping interested parties in the loop. Then enter a name for your workspace and click Create. Now you’re ready to connect a page to your workspace. You can connect Facebook, Twitter, Instagram, or LinkedIn accounts. 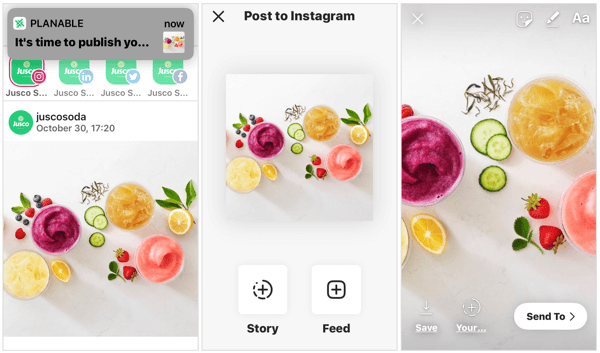 To use the tool for Instagram Stories scheduling, open the Instagram tab and then click Add Profile. After you accept the app’s permissions, your Instagram profile is added to your workspace. Click your profile to connect to it. In the top-right corner of the page, click the + button to add or remove people. Use this option to invite clients or colleagues to your workspace. Now create an Instagram story. On the right-hand side of the window, you and your team or clients can add comments to your post. After you obtain approval from your team or client, you can easily schedule your Instagram story in Planable. You’ll receive a mobile notification from Planable when it’s time to publish. Click the notification to open the post in the Instagram app and add it to your story. 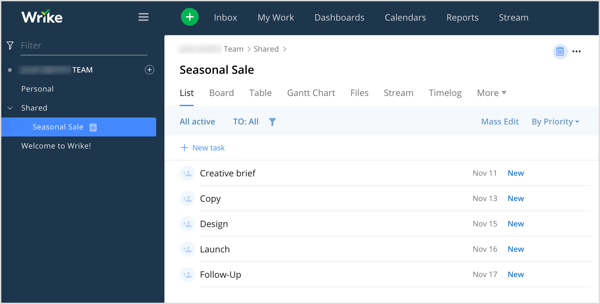 Wrike is a project management tool designed for tracking marketing projects and tasks for a team. It offers an interactive Gantt chart that makes it easy to reschedule tasks and set milestones. 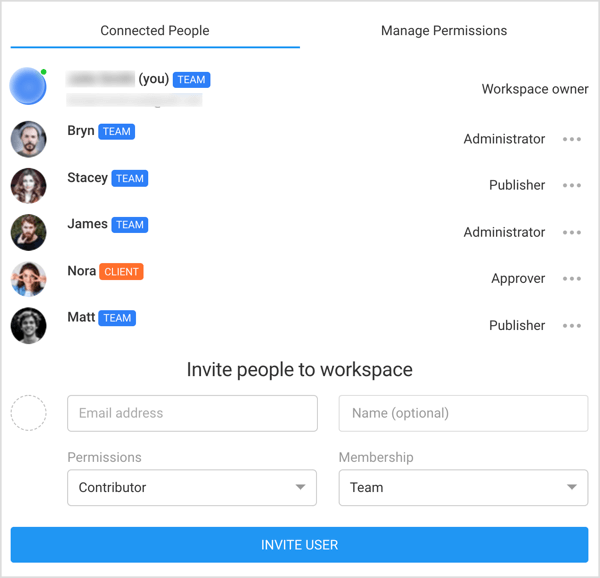 Wrike is available as a free account for up to 5 users. If you have more than 5 team members, you’ll need to sign up for one of the paid plans, which start at $9.80/month, billed annually. 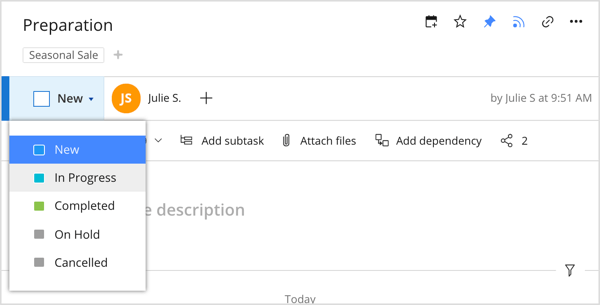 After you create an account, Wrike gives you the option to work from a project template with a basic campaign framework of tasks. You can add and delete tasks as needed to customize your campaign. To open the interactive Gantt chart for your project, click the Gantt Chart tab. Here, you can name your tasks and insert start and due dates. You can also change the date for a task by dragging the due date marker on the chart. When you’re finished adding names and dates to all of your project tasks, you’ll have a good view of the entire project. This makes it easier to anticipate busy periods and allocate necessary resources. 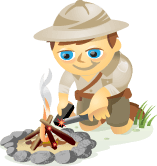 After you add each task, assign it to one of your team members. To update the progress of the task, add tags such as New, In Progress, Completed, On Hold, or Cancelled. You can also attach a file to your task, add it to your calendar, or share it with another person. Tip: If you’re looking for something specific, use the filter option in the top-left corner of the dashboard. Slack is one of the most popular collaboration tools for remote teams working on common project, and it offers a free version. Its project-based channels allow interested team members to access the information they need while keeping other topics separate. While Slack works great for real-time communication, it’s not so great for remote teams separated by more than 5 or 6 hours. That’s where Convergely comes in. 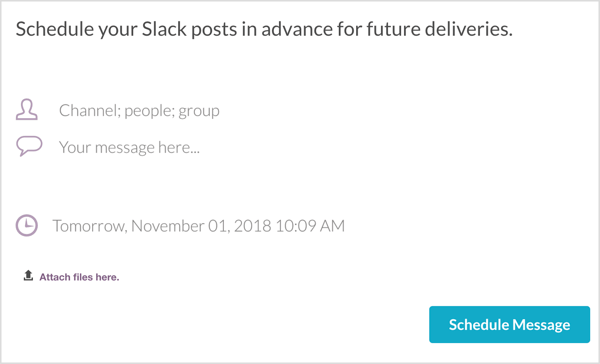 Adding it to Slack will let you schedule important messages for future delivery, delegate tasks, or even create a pool. Convergely offers a free plan, but if you want to use it more than a few times a month, you’ll need to sign up for one of the paid plans, which start at $19/month. 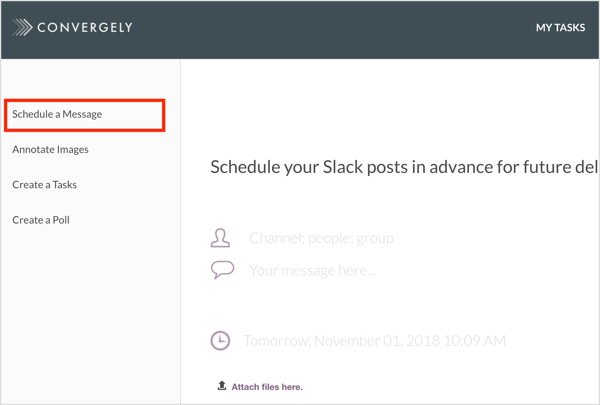 To install this Slack integration, go to the Convergely website and sign up for an account. 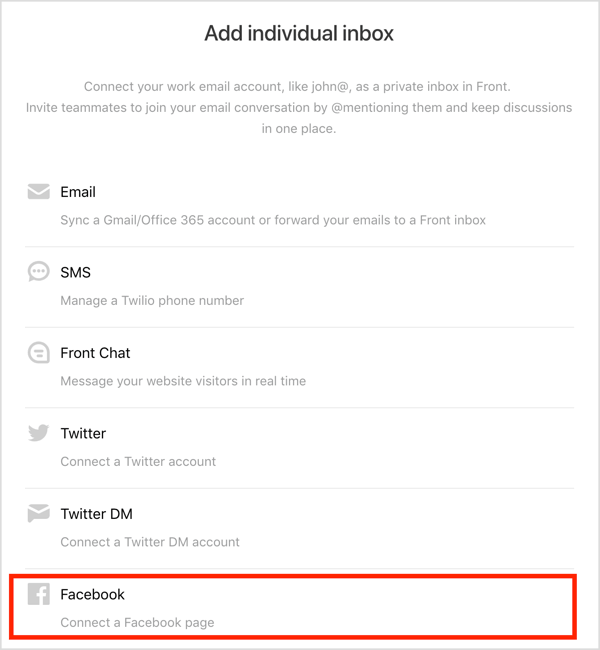 To speed up the process, you can log in using your Slack account. 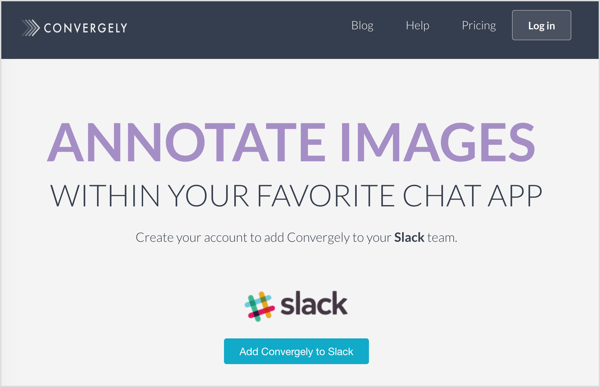 Alternatively, add Convergely via the Slack interface. Simply go to Apps on the left-hand side of the window and search for Convergely in the search bar. After you’ve added Convergely, you’ll see four options in the left navigation: Schedule a Message, Annotate Images, Create a Task, and Create a Pool. Click Schedule a Message. Then choose the channel, group, or people you want to address and add your message. Then set a schedule for delivery of the message. You also have the option to attach files to your message if you want. When you’re finished, click Schedule Message. These six collaboration tools will help you improve communication with stakeholders, get your team and clients on the same page, and manage your social media marketing tasks. What do you think? Have you tried some of these tools to improve communication with your team? What other apps would you add to this list? Please share your thoughts in the comments below. Discover five tools that will help you coordinate the content your team posts on social media. Find out how to use your social media team for more than just marketing. Learn how to manage blog content with Trello. Co-founder @ Socialinsider- a social media analytics tool which serves up a full view of a competitor’s digital strategy. I love writing about social media strategy and consumer behavior.